Mommy Lessons 101: Our first official contest from Mommylessons101.com! Our first official contest from Mommylessons101.com! To thank you for being such loyal readers, we want to have our first official giveaway. No matter what, we will be offering one prize. If we have 200 entries, we will have 2 prizes, and if we have 300 or more entries, we will have 3 prizes. So what are the prizes?? 1) You can choose any two flowers that you want: frayed jean flower, frayed fabric flower (red), singed edge flower (black), or pink cherry blossoms. 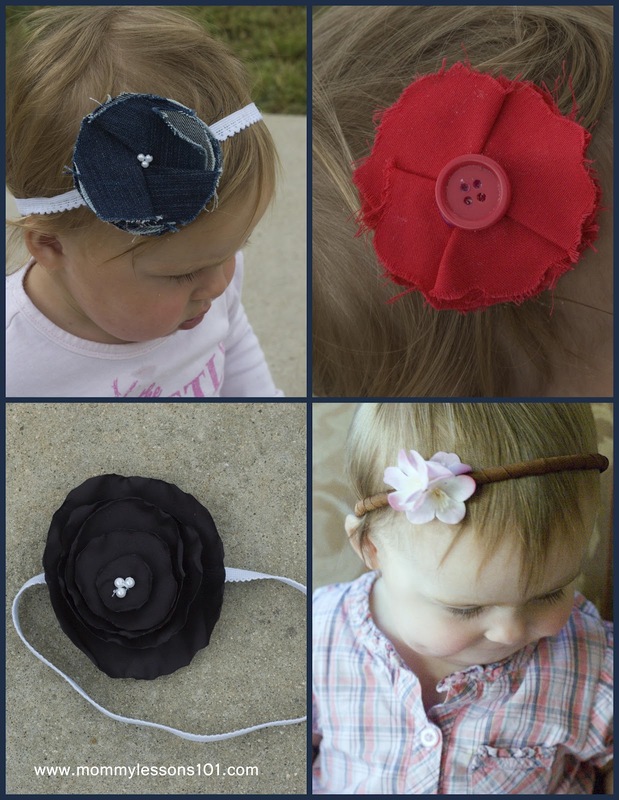 You can choose to have the flowers attached to a traditional headband (wrapped in ribbon), elastic headband, or clips (any 2 of your choice). These are made by our talented writer, Rachel, who talked about some of her flowers in this post. Now, how do get an entry? Well truth is, you can earn up to 8 entries by following the steps below. 1 extra entry: become a follower of the Mommy Lessons 101 blog through google and leave a comment saying you did that. 1 extra entry: comment on any other Mommy Lessons 101 post and leave a comment saying you did that. 1 extra entry: blog about the giveaway and leave a comment with the URL of your blog post. 1 extra entry: pin one of our posts on Pinterest and leave a comment saying you did that. 1 extra entry: for following our Youtube Channel and leave a comment saying you did that. Entries will all be due Friday May 11th at midnight Pacific Time. At this time we are only able to offer prizes in the U.S. Thank you for being loyal readers and enjoy! I love the cute clips and bows! Good luck with the blog! Those bows are adorable! And I have loved reading your blog. You guys have some great ideas!!! congrats on your first big giveaway! I pinned your flower pot cake ~ so cute! Thanks for the great giveaway! I remember reading that train book when I was a kid. I also liked you on FB. Didn't mention that here. Cute Flowers and clips :) Love them! I pinned one of your posts...the cupcake bouquet. What a nice giveaway! Thanks! The bows are adorable, thank you for the giveaway! Great website.....lots of fun ideas. Love the red bow. Cant wait to look through all the website.